On November 16th Hamilton County, IN Superior Court judge Steven R. Nation rejected a motion to dismiss a lawsuit filed by the Indiana Family Institute, Indiana Family Action, and the Indiana American Family Association challenging the “fix” to the Indiana RFRA. The fix, in part, prevents the Indiana RFRA from overriding state and local civil rights laws. It helped Indiana recover from the intense battle over it’s RFRA which led to boycotts against the state. The boycotts began because prior to the “fix” the Indiana RFRA may have allowed discrimination by for-profit entities against members of the LGBT community. The “fix” helps ensure that for-profit entities can not use RFRA to defend against discrimination claims filed under local antidiscrimination ordinances that protect against discrimination based on sexual orientation (state civil rights laws do not include such protection). The motion to dismiss was filed by several municipalities whose antidiscrimination ordinances protect members of the LGBT community from discrimination by for-profit entities. Judge Nation’s order included a provision requiring the plaintiffs to add the state as a defendant so the state will now join the municipalities as a defendant. The groups that filed the suit claim that the RFRA “fix” is unconstitutional because it allows religious exemptions from laws in some situations but does not allow exemptions for conservative Christian for-profit employers who discriminate based on sexual orientation and marriage in violation of local civil rights ordinances. This argument is legally flawed and should fail when addressed on the merits. The most obvious reason for this is that no one, conservative Christian or otherwise, can receive a religious exemption to antidiscrimination laws under the “fix,” and every religious person or entity, including conservative Christians, can receive exemptions to other laws that substantially burden their religion. Perhaps more importantly this lawsuit threatens to undermine religious freedom and RFRAs nationally. As I have argued regularly, one of the great benefits to RFRA is that it protects religious people and entities from having their religion substantially burdened by laws that may not have considered them. Significantly, these accommodations usually have little or no impact on others. The very nature of antidiscrimination laws, however, demonstrates why any religious exemption will have an obvious impact on third parties, namely, the applicants and employees who are discriminated against. Even so, most state and local laws that protect based on LGBT status, including those in Indiana, have exceptions for religious organizations such as houses of worship and religious non-profits. There are good reasons for these exceptions and good reasons not to include for-profit entities in these exceptions. This lawsuit seeks to protect for-profit entities that claim a religious exemption when they discriminate in violation of local antidiscrimination ordinances. Simply put, this will backfire! It lends credence to all of those who argue RFRAs are an excuse to discriminate, and further casts a shadow over the important role RFRAs play in helping religious individuals and entities practice religion without unnecessary government interference. This lawsuit hurts religion and hurts RFRAs. The media attention the lawsuit has garnered will harm RFRAs and proposed RFRAs in other states, and in the long run it will hurt the religious entities already exempted under local ordinances. Many partisans and advocates on the other side of the debate have argued that even traditional religious entities should not be exempted under antidiscrimination laws. If this lawsuit is successful they will have stronger arguments on their side because any exemption for religious entities might necessitate exemptions for for-profit entities. I hope that the municipalities, and now the state, are able to successfully defeat this ill conceived lawsuit before it wreaks havoc on protections for traditional religious entities and allows harm to members of the LGBT community. Moreover, religious organizations and members of the LGBT community should join together in public opposition to this lawsuit. I am pleased and quite humbled to note that Freedom’s Edge: Religious Freedom, Sexual Freedom, and the Future of America (Cambridge Univ. Press 2016) was nominated for a PROSE award. Now that the 2016 Presidential Election is over, what can be done to protect both religious freedom and sexual freedom? I have spent the last few days thinking about this and trying to wrap my brain around the issues that may arise. I am not sure I am up to the task, but here are a few thoughts and suggestions. First, the tides in the culture wars ebb and flow and it seems that now we may have yet another shift. It is a huge mistake for either side to view these political shifts as proof it need not compromise. A few weeks ago some cultural warriors on the sexual freedom side were casting religious freedom as the enemy and it seemed that this position was gaining in power as advocates for religious freedom hunkered down. This week some culture warriors on the religious freedom side are casting sexual freedom as the enemy and feel empowered to act on their instincts as advocates for sexual freedom are hunkering down. Yet, the tides are likely to turn again in the future and the best way to protect religious freedom and sexual freedom is for both sides to compromise. I said this before the election and I say it after the election: No one is well served by dehumanizing the other side and becoming so overconfident that they fail to consider the possibility of compromise. Just as before the election compromise benefited not only religious people, but also members of the LGBT community, today compromise benefits not only members of the LGBT community but also religious freedom. I laid out the methods and mechanisms for compromise in the book Freedom’s Edge. While the political tides continue to ebb and flow both sides must step back from the brink and give empathy a try. Doing so requires introspection, and a bit of introspection is good for everyone in the long run. Without it we will enter a downward spiral of brinkmanship that will bounce back and forth with the political tides until one side eviscerates rights on the other side. Whichever side loses it will be a huge loss for American freedom and values. Second, we need to look not only at the Presidential election results, but also at Congress and state legislatures. The legislative process is where RFRAs and anti-discrimination laws are born. I continue to urge legislators to look at laws like the Utah Compromise as proof of concept that through compromise common ground can be found. Ideally, we will see RFRAs that protect individuals and traditional religious entities, but exclude large for-profit entities, and we will also see anti-discrimination laws that protect the LGBT community, but include exemptions for traditional religious entities. The nature and range of entities protected under such an exemption must be carefully considered as I explained in Freedom’s Edge. Third, words and framing do have power and we are sadly seeing the results of this on a nearly daily basis as some—although certainly not all—Trump supporters have become emboldened to lash out against those in the minority, including Muslims, Jews, members of the LGBT community, African-Americans, and immigrants. I have seen this first hand as several students have come to speak with me about situations they have faced (mostly off campus) since the election. These have ranged from slurs on social media to downright harassment. As religious minorities face increased backlash the importance of RFRAs may become more clear to many progressives who lost sight of why RFRA’s are a good idea. At the same time, as members of the LGBT community face increased backlash, the importance of anti-discrimination protection will become more clear to many conservatives, or at least to those who are moderate on social issues. What does the future hold? Who knows. I am afraid for the freedoms and values on both sides as our nation becomes more divided and divisive than ever. I beg those of you who share my commitment to protecting rights on both sides to not lose your voices or become complacent. Now, more than ever, moderates need a voice so that members of the LGBT community and people of faith can be protected against the worst instincts on each side. As promised in an earlier post, I am happy to announce that Freedom’s Edge: Religious Freedom, Sexual Freedom, and the Future of America (Cambridge University Press 2016) is now widely available through the CUP website, Amazon.com, BarnesandNoble.com, etc. The paperback and electronic editions are far less expensive than the hardcover edition, which is primarily designed for libraries. Also, an important note for those who have been following the Masterpiece Cakeshop case, which is currently before SCOTUS on a Petition for Writ of Certiorari (a petition requesting that the Court hear the case). On September 15 SCOTUS issued an order extending the time for respondents to file their Brief in Opposition to the Petition until November 29, 2016. Once the Brief in Opposition is filed the petitioner can file a Reply Brief. This is usually done within 10 days after the filing of the Brief in Opposition. This blog will keep you posted as we move toward the SCOTUS’ decides whether to hear the case. As mentioned in an earlier post the Court denies most petitions for certiorari, but some commentators believe the Court will hear this case. I am not convinced the Court will hear the case because the state courts which have heard cases involving public accommodations have generally been in agreement, and of course, state laws vary widely. The Court would need to be convinced the case presents an important issue under the United States Constitution. The problem is that any argument the Colorado anti-discrimination law is not one of general applicability is weak so the Court’s decision in Employment Div. v. Smith (a case I think was wrongly decided) makes the Free Exercise Clause claim nearly impossible to win. The Free Speech claims are a possible basis for granting the petition, but it is hard to guess what the Justices might think of those claims. On the other hand, the petitioners argue that the United States Courts of Appeals are split on the constitutional issues, which can be quite important in getting the Court to hear a case, and the case presents questions of great public importance with significant implications for both sides. Thus, guidance from the Court could be helpful. 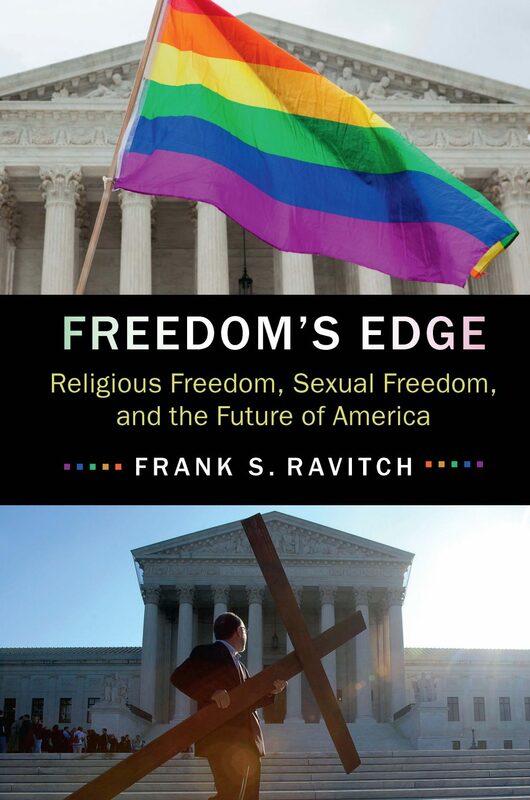 I am happy to announce that Freedom’s Edge: Religious Freedom, Sexual Freedom, and the Future of America (Cambridge Univ. Press 2016) is now in print. It should formally move from “preorder” to “available” on the CUP website by next week, and on Amazon, etc. . . shortly thereafter. I will post a formal announcement on the blog once I have confirmation it is immediately available through CUP, Amazon, and Barnes & Noble. Most importantly, however, I want to thank the folks who agreed to read the finalized proofs because I did not have the ability to thank them in the book since it was already going to press when they read it. I selected a few folks on each side, both non-lawyers and lawyers, with strong background on these issues. These folks were kind enough to read the book after I received the final proofs to help me gauge reader response. Writing a book on this controversial topic for a broad audience, consisting heavily of non-lawyers with an interest in these issues, students, lawyers, and legal academics, was daunting. Doing so from a moderate, non-judgemental perspective seeking to protect both sets of freedoms to the greatest extent possible was perhaps more daunting given the highly polarized times in which we live. The readers provided great insight and I am humbled that they found the book to be so balanced, even if some might have preferred I take their side. I was most humbled that the non-legal readers felt they understood the law better after reading the book and the legal readers still found the book to be highly useful. Thank you for taking the time to read the book!